This week’s stitch on SSS challenge is vault stitch. The working of this needlepoint stitch is on Queenie’s blog. I have never heard of this stitch. It goes by other names too [ex] fan vaulting, Church roof stitch… I was trying to find this stitch on the net, but was not very successful. The stitch consists of two parts, one worked vertical and second part horizontal. First I thought this was just a variation worked by Queenie, then realized the stitch is completed only after working both parts. 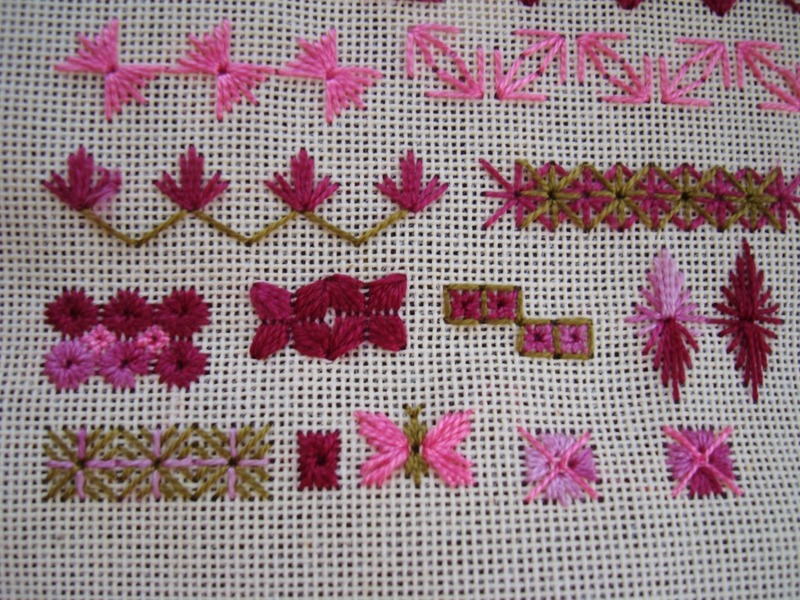 The sampler is started with the basic vault stitch. In the second sample the horizontal stitches are narrow. The third sample is a variation- the horizontal stitches are worked wide and narrow alternatively. In the fourth sample, the vertical stitches are short. In the second part of the sampler, the first row is vault stitch worked in two colours. The two threads were worked continuously by parking aside the non-working thread. The vault stitch is outlined with running stitch in the second sample. 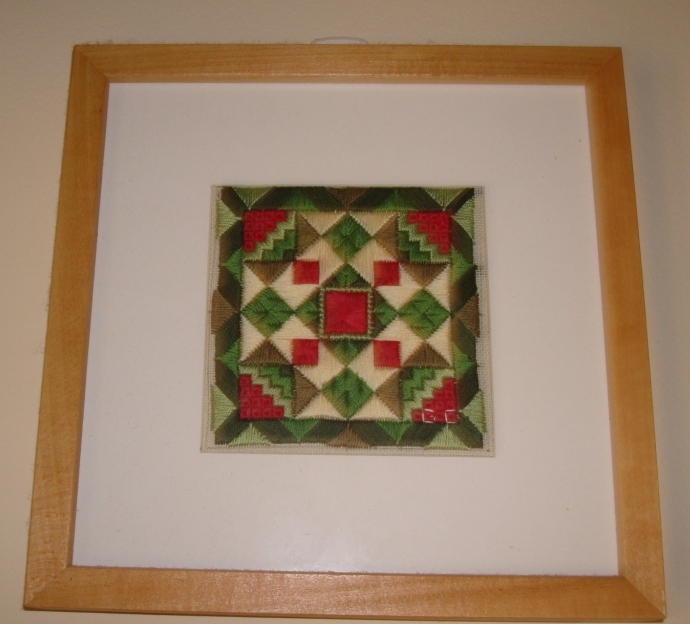 Three arrangements were tried with vault stitch in the last part of the sampler. 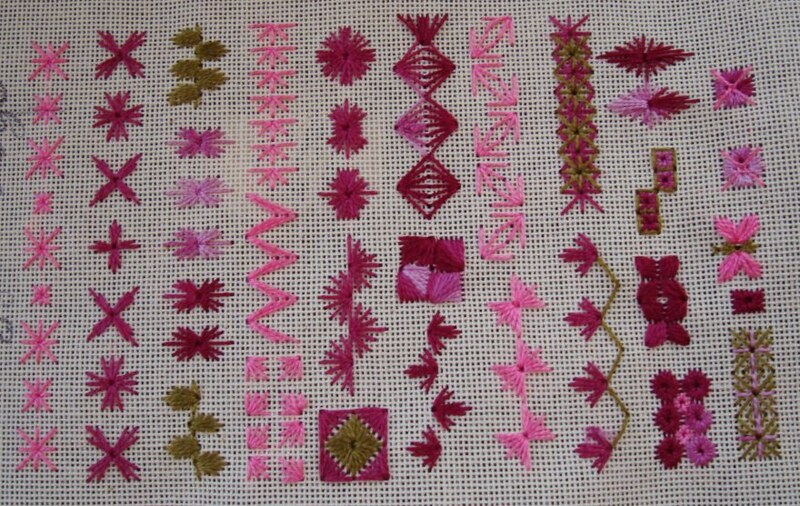 It was interesting to arrange the vault stitch in the last part of the sampler. With these samples vault stitch experiments are over. This week’s stitch on Sunday Stitch School challenge is gate stitch. It is a canvas stitch which can be worked on even weave or plain weave too. I have worked the samples as fillings on canvas. The working of the stitch is explained here. Details of the samples from left to right. The first sample is the basic gate stitch without any space between the satin stitches. The second sample is worked with spaces between the satin stitches. Alternate blocks are worked in gate stitch in the third sample. The same idea is continued in the fourth sample with two threads. The vertical and horizontal versions of gate stitch are worked in the first sample. 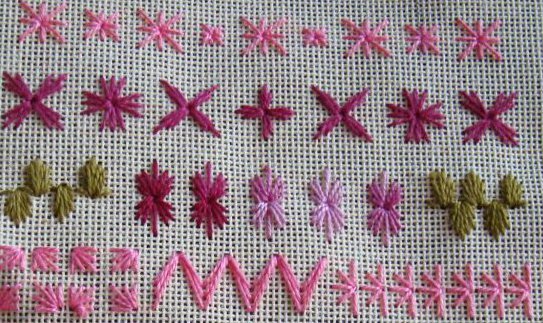 The satin stitches are worked in one thread and the overlapping cross and straight stitches are worked with different thread in the second sample. The gate stitches are worked at two levels in the third sample. The crosses are worked smaller than the satin stitches in the last sample. The crosses are worked at different levels. 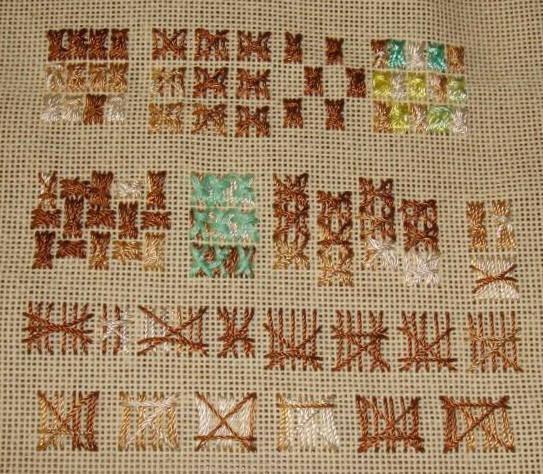 The wide and narrow version of gate stitches are tried in the first four samples. The satin stitches are extended on top [fence like] on the next four samples. Satin stitches are worked in twos and threes and are alternated in these samples. Since, the stitch is simply straight stitches worked in different ways, I am not detailing the samples. I worked these samples on canvas.